Estate Cartridge stands for providing high quality ammunition without making hunters and shooting enthusiasts break the bank paying for it. 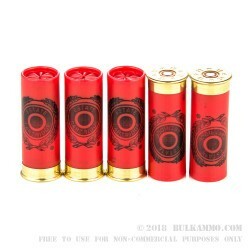 This 12 Gauge shotshell’s even patterning wad, clean burning propellant, sturdy plastic hull, hard and spherical shot, and reliable and sensitive primer are all what you should expect from a premium line of ammunition, but for a very attractive price. 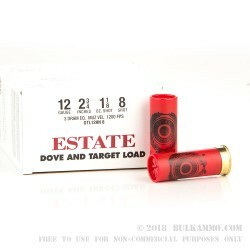 This shell’s box says that it’s for dove and target shooting, and its #8 lead shot certainly makes it so. 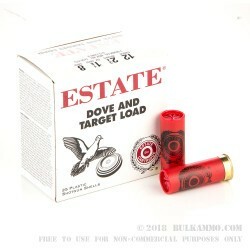 The 1 ⅛ ounces of .09” diameter pellets it contains are the perfect size for dropping smaller birds including woodcock, quail, grouse, and of course dove, but without shredding their trophies to ribbons in the process. 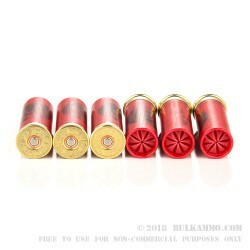 This shot’s range and spacing also suit it for busting distant and fast flying clays, so you’ll be well-equipped wherever you bring a box of these hard-working red firecrackers.